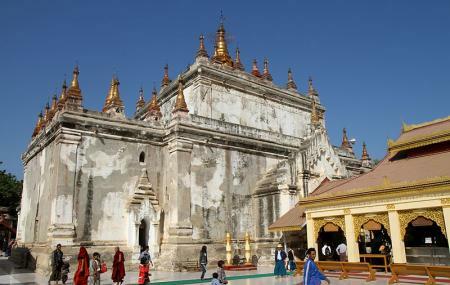 A Buddhist temple built by the Mon King Manuha, the Manuha Temple in Bagan is a place you should head straightaway. The temple has huge Buddha statues and are an interesting to watch. There is a reclined Buddha statue which you should watch for sure. In order to soak yourself in divinity and worship the almighty, this is a great religious place. On your trip from Old Bagan to New Bagan, stop for some time and do witness these gigantic Buddha statues. How popular is Manuha Temple? People normally club together Ananda Temple and Dahmmayan Gyi Phaya while planning their visit to Manuha Temple. This temple that appears somewhat pyramidal is just big enough for the three huge statues of Buddha in a sitting position, and one of a recumbent Buddha. There is a huge pot in front, reminding one of the alms seeking bowl of monks . Devotees climb up a small ladder and drop their offerings in the form of money in it. Other kinds of offering, namely rice etc. are placed in front of this bowl. When it was learnt that the king Manuha , who constructed this temple, made it in such a cramped style as a representation of his own travails in captivity, one could not but wonder whether he constructed it out of devotion, or out of vengeance. You can see, you can feel when you arrived temple. One of most famous Temple in Pagan. It was build by King Manuha (Mon's King). Prompt strange design is huge Buddha Image is not match with this temple size. When you visit there, sure get suffocate feeling it is reflect/ come from King Manuha who was in Jail when this pagoda's construction time. This Pagoda Expresses emotion of a prisoner who was a king. The pagoda or temple that I most wanted to visit. When I get there (in December 2018), the temple was under repair and it's a nice place to visit as I have ever thought. Hopefully this temple would be kept and maintained for long term as an acient heritage like other Pagoda & Temple in Bagan.